Who was he? 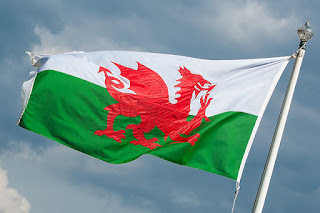 There isn’t much known about his life, but it is thought that his parents were both from Welsh royalty, and that he was born during a violent storm on a cliff top. Upon research I realised there are a lot of stories about St David, about his life and his miracles. I think my favourite was when he founded the monastery at Vallis Rosina – Glyn Rhosyn in Welsh, in Pembrokeshire. He obviously knew the area very well, and he knew exactly where he wanted to build the monastery it was in a brilliant position, over looking the sea and protected by the hills. It was time to begin to make plans so off David went along with two other monks to the site where he believed it should be built. In celtic tradition to claim the land you had to build a fire and wherever the smoke reached was the amount of land that became yours. The land at the time had been claimed by Boia, who had a large settlement further north. Boia looked out and saw the smoke rising and spreading out in all directions. He was dismayed someone was challenging him for his land. Boia had a rather bossy wife, who told Boia to go and claim back his land, so he went off with swords to challenge David and his monks. But on the way there he became ill and so did his soldiers so when they arrived they were weak and all they could do was shout at them. When they did this all Boia’s cattle died. When Boia and his men returned home his wife wasn’t very happy so she sent maids to trick the monks into leaving, but that wasn’t going to happen and her plan didn’t work and Boia’s wife mysteriously disappeared. The monastery was built by the monks and David was a hard task master, telling the monks that building the monastery was worship to God and they were not to speak whilst working but to spend their time in prayer as they worked. The monastery became a place that many people visited for healing and a place where you could learn. It was a place where all were welcome including the poor. Throughout his life David spent his time comforting people, and serving God. It is thought that he preached his best sermon just before his death, he took communion and he told those gathered to listen to him. "Remember the little things you have seen and heard me do." As David knew that many of those gathered were very poor and they had very little to give. But he told them that the greatest gift they had to give was to love one another and treat each other with kindness and respect. The monastery is no longer standing but in its place is St David’s Cathedral and I’ve been told that if you sit in the cathedral you can hear the sea. I look forward to visiting it in the Spring time and discovering the kind and loving spirit of St David. All around Wales on St David’s Day children still dress up in national costume and play games, listen to stories, and celebrate all that it means to be Welsh. There are numerous crafts, activities, puzzles and worksheets on the internet for children to do. I particularly liked the model in traditional welsh dress from Activity Village. Click here for all their crafts etc. In one school this year they had an art competition with the title ‘What is means to belong’ and excellent title and perhaps something that I think St David would have felt strongly about. But perhaps I will leave you with that thought and tackle it another day. who this person was, what he did in his life, and where he came from that he should become a Saint.